Many enzymes work together in the replication of DNA. The focus of this post will be on the topoisomerase enzymes and their function. In another upcoming post, I will introduce topoisomerase inhibitors. It is important to understand what is going on with these enzymes and how the topoisomerase enzymes work to relieve torsional strain during DNA replication. 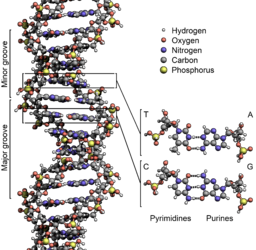 When DNA is at equilibrium and not under any torsional strain, one full rotation of the double helix contains 10.6 base pairs. When it is replicated, the entire DNA strand has to be divided into two new strands. This separation introduces a significant amount of torsional strain in the DNA coil. (Think of that handset cord on your desk phone that is completely tangled up because of all of the rotations of the handset over time.) This process of DNA entanglement is called supercoiling. The only way to relieve the strain is to break the DNA, pass a segment through, and put it back together. The topoisomerase enzymes do just that. They relieve the mounting torsional strain before the strain becomes so great that the replication process is halted. Still confused? Take a look at this video.